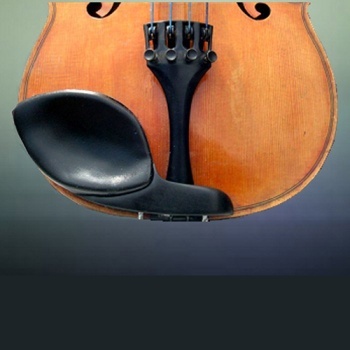 Pictured is the Strad style GelRest, shown here mounted on a typical Strad style chinrest. The peel-and-stick adhesive makes it easy to install, but it also stays securely in place and can be removed easily with no residue. To clean, spray any mild, streak-free cleaner on a soft cloth, or paper towel, and wipe and wipe off. Like most adhesives, the GelRest adhesive lasts longer if it is not removed too often, so clean in place as often as possible. This GelRest also fits most medium-sized chinrests, such as Medium Guarneri. Stuber, and Vermeer models. Not sure which chinrest you have? Measure it and compare with these dimensions: 95mm long X 60mm wide. Dimensions 95mm long by 60mm wide (about 3 5/8 long X 2 1/4 wide). Measure your chinrest and compare with these dimensions to see how this GelRest will fit. The Strad is an excellent choice for the Medium Guarneri chinrest.